HERE NOW FOR 2019 AT ALL ROUNDER CRICKET - THE PACEMAN BOWLING MACHINE - THE CHEAPEST BOWLING MACHINE ON THE CRICKET MARKET and SELLING FAST! Designed by Paceman to be more accurate, efficient and durable than a normal Paceman Original machine. 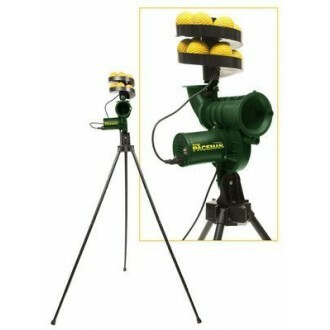 Your own bowling machine to use in your back garden or on your drive!!!! Cricket coaching and practice made easy by Paceman! Your own bowling machine to use in your back garden or on your drive!!!! Cricket coaching and practice made easy by Paceman! Designed by professional cricketers in conjunction with Paceman. More accurate, efficient and durable than an ordinary Paceman machine. 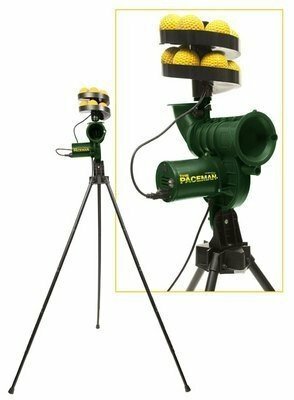 The ultra great value Paceman Bowling Machine brings quality, accurate, reliable batting practice for all standards of Cricketer at an affordable price. It is comfortably the most affordable bowling machine on the cricket market. Features include : - Easy to assemble bowling machine, put away & store - Variable bowling machine speeds up to 100kph (60mph) - Able to produce inswing & outswing deliveries - Fully adjustable for full pitch & short pitch deliveries - includes automatic 12 ball feeder attached to the cricket bowling machine. Important note ...The bowling machine is to be used EXCLUSIVELY with Paceman Light Balls for safety & performance only - Requires Mains Power supply - Colour of Bowling Machines may vary - Adult supervision required / recommended when operating the Paceman Bowling Machine. From a cricket coaching angle this product is perfect for junior cricketers to improve their game in the comfort of their own back garden. Various coaching drills can be used on this bowling machine to improve both front and back foot techniques.